Do you sometimes find that you are unable to see the light signals emitted from your Bellman Visit Flash Receiver? This particular receiver uses bright, flashing lights to make any alerts as obvious as possible. However if your device is sat on a surface, especially if tucked away, it can be difficult to see the signals from everywhere in the room. The Bellman Visit Wall Mount Bracket helps to overcome this problem by allowing you to affix your existing Bellman Flash Receiver to the wall. By placing the device higher up, you will be able to notice any incoming signals more clearly, without the risk of blind spots. How Does the Bellman Wall Mount Bracket Work? Mounting your Bellman Flash Receiver to the wall also reduces the risk of it being damaged, keeping it out of reach of small children and preventing it from being knocked off its surface. 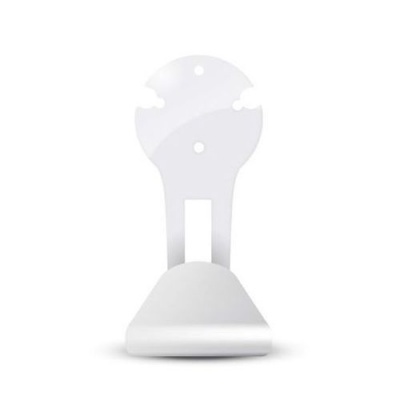 The Bellman Wall Mount Bracket comes complete with screws, plug, cable clip and mounting instructions so that you can easily affix it to the wall, without needing to buy any extra screws or adhesive. Clear instructions ensure that putting up the bracket is simple and safe. You can then benefit from clearer signalling to ensure you don't miss an important alert. The Bellman Visit Wall Mount Bracket is designed for indoor use alongside your Bellman Flash Receiver, which can be purchased separately.